Art Corner ~ Share, Comment and Critique! Hello! I have made this new discussion as an "Art Corner". 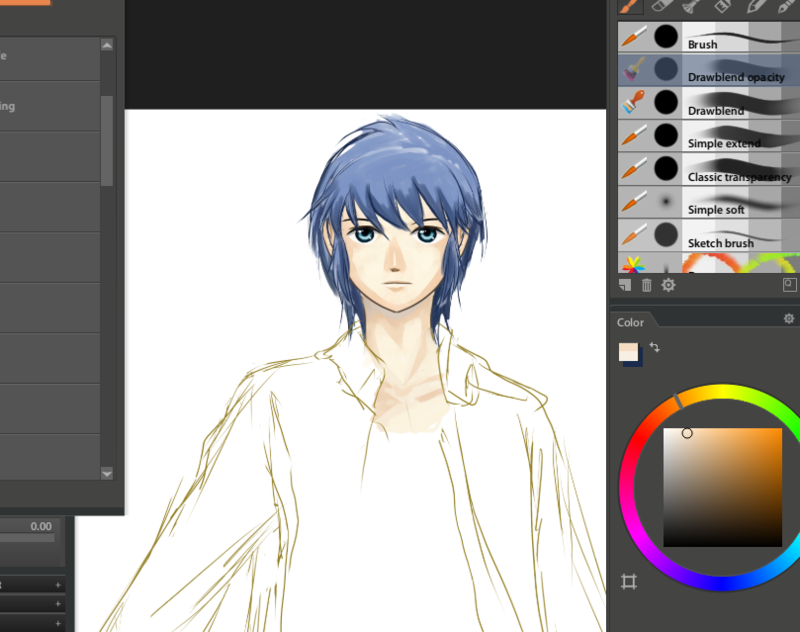 Here you can share your WIPs (Work In Progress) or other live2D art! Also, if you're ready, you can also post a request for a critique on your live2D art! 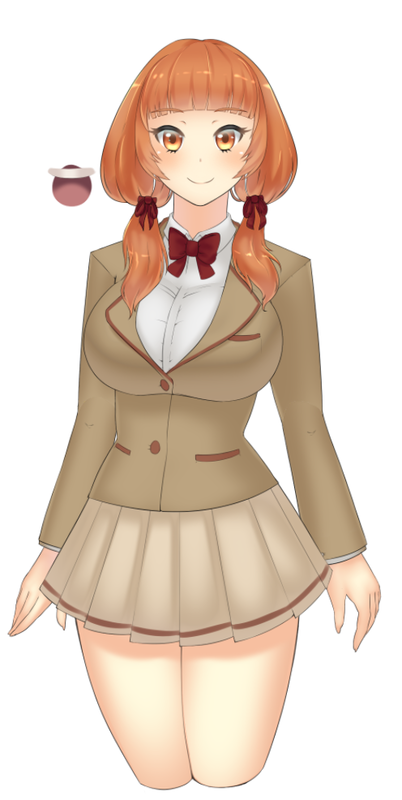 I am working on an indie game (a dating sim), and an artist on my team made art for one of the characters to use with Live2D, but without some details. 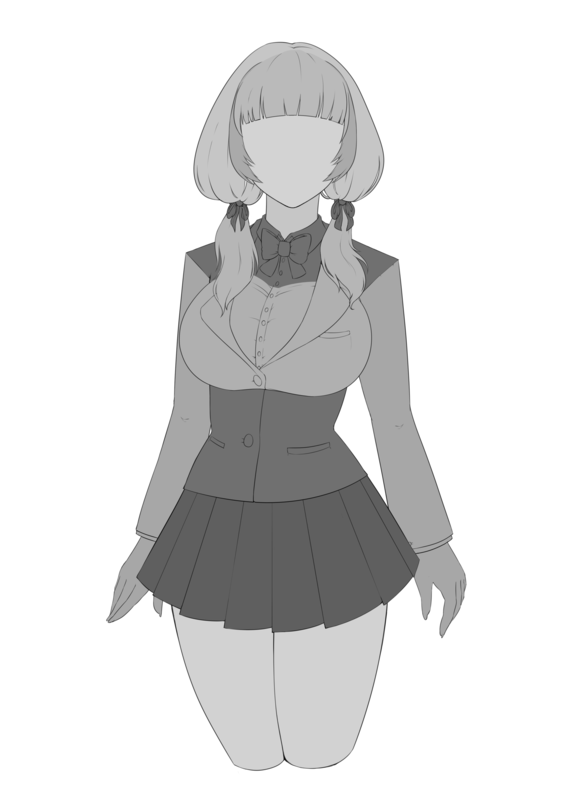 I will add a face, color, animation, etc to her work later. In preparation for me to color it, she has separated the lineart into parts, and added a gray "base" to each of them. I think that the result is very interesting to share, because it shows in different tones in gray the different individual parts of art that has been prepared to be used with live2d - something that you cannot see with regular art. For example, you can see how her hair and torso has been separated into smaller parts. It seems really good idea to share something with everyone! Just for your info, we have a Live2D library for users to share their products. If you're interested in it, i'd like you to check the link below. Also, we are happy about you sharing the character you creat if that's OK with you! 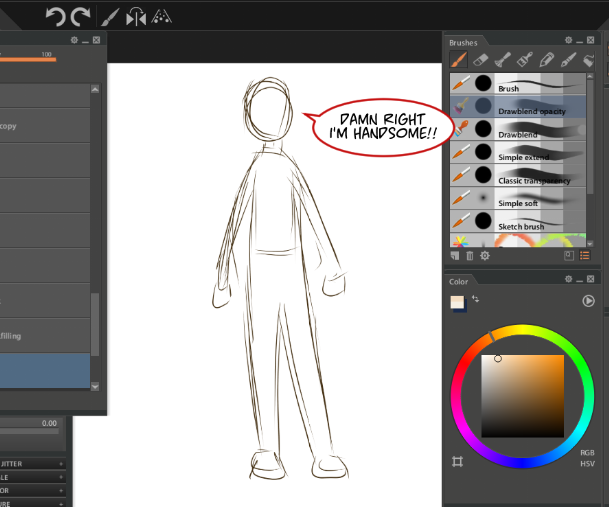 So you are doing the face, coloring and animation. That's an interesting collaboration. That was nice of her (the artist) to put those tones to help you with the coloring. I imagine it requires some decent level of trust and coordination. But from what I can see you guys seem to be there. I can't wait to see your progress. Ok, here is something I did after I read your topic about the head problem. I wanted to show you how I do mine and explained it to you, but I didn't have any good example ready so I gave you a link to one of those video tutorial. This animation was finished yesterday. Later I'll make a different topic with my steps by steps screenshot. I don't want to overflow this discussion room with my lecture. Right now I'm testing this new software tool (Paintstorm: http://www.paintstormstudio.com/ ) I recently got. So far I find it a bit frustrating to use. There are some bugs. I hope they fix it in the next update. I did a little bit of painting. It's still work in progress. Ok, that was a bad joke. Here is the real one. This drawing was done for the sake of testing their painting tools. I might not finish it depending on the progress I make with the program. Ok, I should stop now. If you read this far, well, congratulations and thank you for reading. 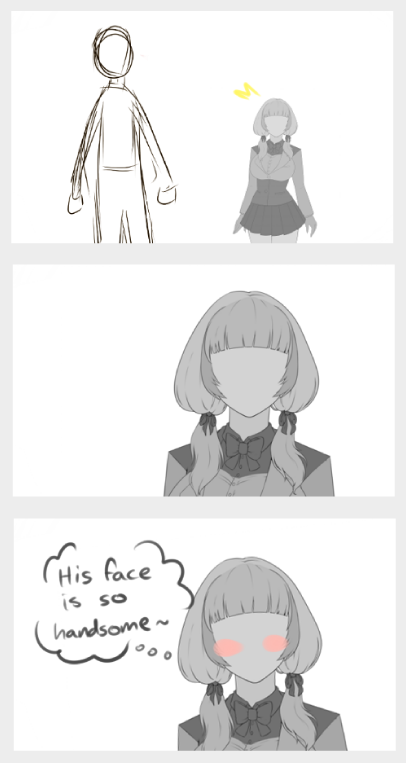 Faceless people can fall in love too! lol. Ah, that is very cool, Naotaro, thank you for linking it! I will try upload some in the future. I did some clipping mask experiments! I think that there is a lot of potential and possibilities to explore with this feature. I like the "shining goggles" effect I got here. I have a character that has glasses - maybe I can add this effect to her, and have the shine "move" when she moves her head. Certainly a lot of new effects with light and shadow can be done with clipping mask! Yeah, that's why I love this new feature they added. Not only it opens many possibilities, but also makes some animation faster and easier to do like blinking. 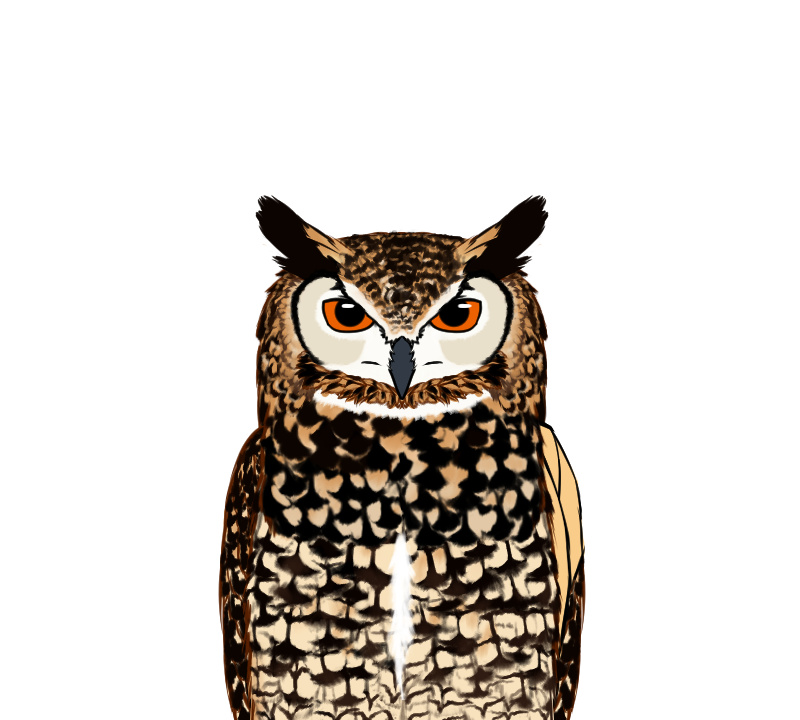 Click the gif to see the animation of blinking. So here is the character I was working on! Is... 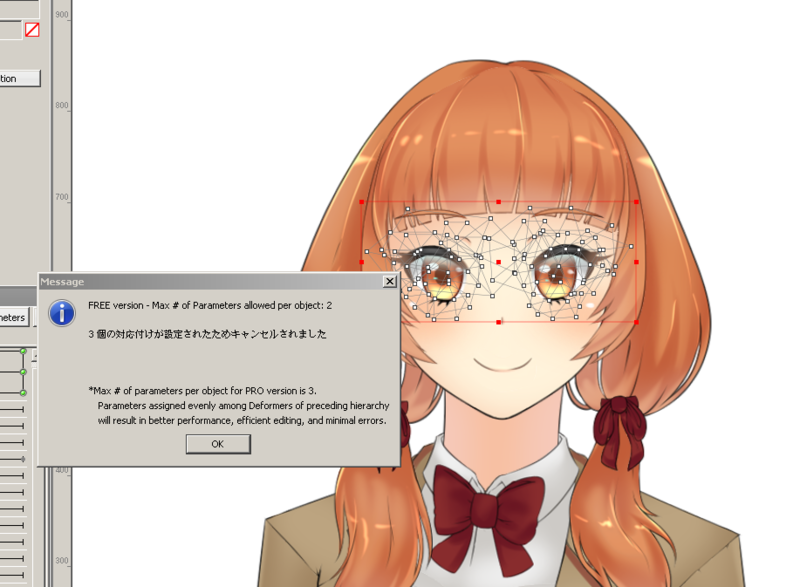 There a way I can add eye blinking (EyeL and EyeR Open) AND head rotation (Angle X, Y) AND Left Eye Smile, Right Eye Smile, etc to my character? There are so many parameters (More than 3! ), how are they all added? She is so cute ^_^ Nice work!! It'll be tough to do it with 2 parameters limit. I can think of some ways to do it even with the limitation, but it'll take me a while to explain it. Agh, if only I have time, but I'm so busy these days I haven't been able to finish my tutorial yet. Work in progress about head turning left, right, up and down. I'll add upper left, upper right, down left and down right later. It's fast animation because gyazo can only record 7 seconds and then it loops. Hello, guys I' new here and I thought I'd share this one.